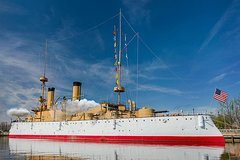 Climb aboard two National Historic Landmark ships, the 1892 Cruiser Olympia and the WWII and Cold War Submarine Becuna. Maneuver an underwater robotic vehicle, fire a mock cannon and explore U.S. naval history. Visit the Workshop on the water to see wooden boat builders in action. Discover the atmosphere of Philadelphia’s historic shipyards with Diligence, the 1797 re-created gunboat once built in Philadelphia to defend this young country from pirates. Visit two National Historic Landmark ships, the 1892 Cruiser Olympia and the WWII and Cold War Submarine Becuna. Olympia is known for being Admiral Dewey's flagship during the Spanish American War and also receiving the honor of bringing the soldier for internment for the Tomb of the Unknown Soldier in Arlington Cemetery. Becuna is a more modern day example of the technology and bravery of submariners in WWII and the Cold War. These ships will have ladders, hatches & gangways to navigate. The historic ships are not ADA accessible. Explore two floors of the museum with exhibits that cover various maritime topics. Galleries include: Disasters on the Delaware: Historic Disasters and Modern Day Heroes, Tides of Freedom: African Presence on the Delaware River, Tattoo Lounge, Titanic Philadelphians, Boat Gallery, Underwater Gallery, and more. Observe working wooden boats builders in action, in the Workshop on the Water and as they build the schooner Diligence. This gunboat was built in 1797 in Philadelphia to defend this young country from pirates. This new exhibit and ship is inside the museum, making it all the more impressive.